-Liam, a young Irish immigrant is killed in a car accident that turns out to be an insurance scam. Danny tries to juggle his investigation with a romantic weekend with Linda. -Linda feels disappointed that she doesn't have Danny's attention. She calls a girlfriend to see the Broadway show as Danny meets with his informant, Rosalita. -Rosalita records evidence against the doctor running the scam. Danny is able to make his arrest and finish his romantic evening with Linda at the hotel. 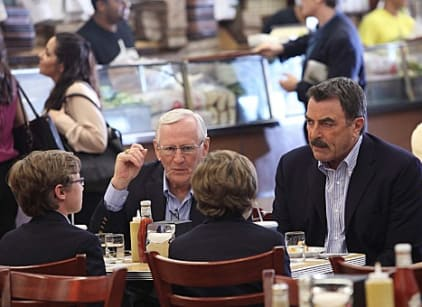 -Frank and Henry watch the Sean and Jack and give them life advice over dinner. Thankfully Henry lost their theater tickets. He was going to take them to see The Book of Mormon. -Jamie gets invited to a family dinner by Noble Sanfino, the crime boss' son as a thank you for saving his life. Jamie decides to go as part of his undercover assignment and watches Sanfino pump his dealer full of drugs as retribution for his overdose. It looks a lot more like a date than an accident. Permalink: It looks a lot more like a date than an accident. Frank: What about nap time? Henry: The boys are too old for naps, Francis. Frank: I meant for us.